A more resilient and healthy forest. 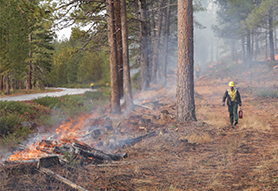 As favorable weather conditions persist, prescribed burns are planned near Bend, Crescent, and Sisters. 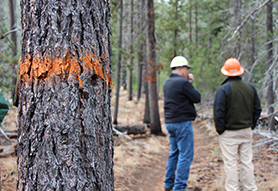 We're working to reduce our risk of wildfire, keep our communities safer, and make our forests healthier. Forest restoration treatments like prescribed burning can help us live with, rather than fight fire. West Bend Project receives the Forest Service’s prestigious top honor for outstanding accomplishments. The Deschutes National Forest is an important wildlife habitat, an economic engine for our region, a source of clean and abundant water, and a world-class recreational playground. 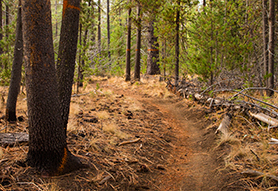 The forest is the backdrop of our lives, a core piece of our identity as Central Oregonians. We count on the forest. Now the forest is counting on us. After nearly a century of unsustainable forest management practices, including fire suppression in our forests, we now live next to a literal tinderbox. Without action, the forests we love and many of the things we care about in and around them are at risk. 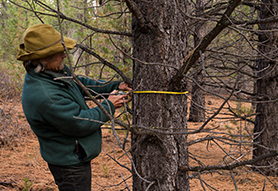 The West Bend Project is one of 10 primary forest restoration project areas on national forestland within the larger 250,000+ acre Deschutes Collaborative Forest Project landscape. The goals of this project: restore forest ecosystems, reduce the potential of high-severity wildfire, and provide economic and social benefits to local communities. The Deschutes National Forest is an important wildlife habitat, an economic engine for our region, a source of clean and abundant water, and a world-class recreational playground. The forest is the backdrop of our lives, a core piece of our identity as Central Oregonians. But it needs our help. Without action, the forests we love and many of the things we care about in and around them are at risk. We are working together, in partnership with the U.S. Forest Service, to overcome past conflict and gridlock to restore balance in our forests, making them more resilient to fire, insects, diseases, and climate change. Join us as stewards of the forest we all love and share. Tell your friends, neighbors and family about this important work. Sign up for notifications and updates, public meetings and forest tours. Ask us to come and speak to your community group.